Jacob smiled and took the glass of drink. Inwardly, though, he grimaced. It was the same drink she offered him every time, but he was too much of a gentleman to refuse it. So he braced himself and took of a drink of the prune juice that he couldn’t stand the taste of. Categories: general, Uncategorized, writing | Tags: #tuesdayuseitinasentence, blog post, prompt, prune, sentence, writing | Permalink. Levi and his black Labrador, Sirius, walked up the steps to his apartment’s front door. They had been on a nice walk and had a fun time at the dog park, so both were in good spirits. But the yellow sheet of paper taped to the door with the giant NOTICE in red lettering that greeted them quickly dampened Levi’s spirits. “Notice is hearby given…” Levi read out loud before finishing reading the rest of the letter silently. Beside him, Sirius let out a small whine, sensing something was wrong. Levi snatched the letter off the door and crumpled it in his hands angrily. Then the weight of what he’d read hit him and he plopped down on the steps, holding his head in his hands. Sirius settled down beside him, letting out another low whine. Dejected, Levi sat there for a while, just holding tight to his dog. Dark clouds built up overhead, and a light rain began to fall, but Levi didn’t pay it any notice. All he could do was stare at his shoes and think about having to move so suddenly. After a few minutes, Levi noticed he wasn’t getting wet any more. He also noticed that someone was speaking to him, asking him if he was all right. He had a sense that they’d been asking for a few minutes. He lifted his eyes from his feet to see a lovely young woman about his age standing in front of him. She was holding an umbrella over him. A Golden Retriever sat stoically by her side. “Are you all right?” the lady asked Levi again. “Not unless you know of an available apartment that allows pets,” he replied. Levi let go of Sirius, who sat up straight beside him, and showed her the offending notice he’d gotten. Levi stared at her as if she were an angel sent from God. She smiled and held a hand out to him. With a smile of his own, he took it. “I’m Angela, by the way,” she said as he stood up. The group walked back towards the street. Overhead, a rainbow had formed. Categories: animals, general, Uncategorized, writing | Tags: blog post, dogs, notice, pets, prompt, SoCS, story, stream of consciousness, writing | Permalink. Nick thought that listening to Jerry Lee’s conspiracy theories was bad enough. But when Jerry Lee showed him a hat he’d made from aluminum foil that he was going to use to foil the plans of aliens and the government to read and control his mind, Nick could only roll his eyes and wonder yet again why he bothered to hang out with Jerry Lee. Then Jerry Lee handed him a cold bottle of beer, and Nick remembered why. Categories: general, Uncategorized, writing | Tags: #tuesdayuseitinasentence, blog post, foil, prompt, writing | Permalink. 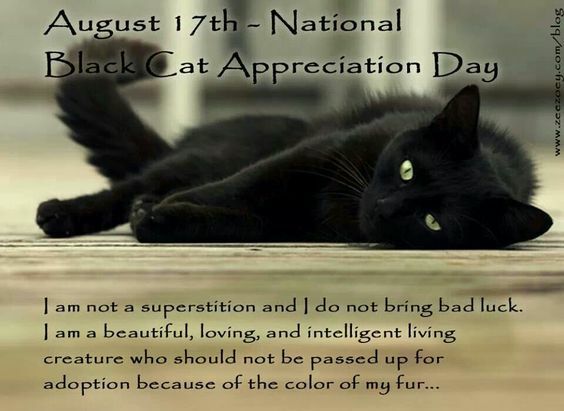 As someone who’s proud to have been owned by a black cat, I want to wish everyone a happy Black Cat Appreciation Day. 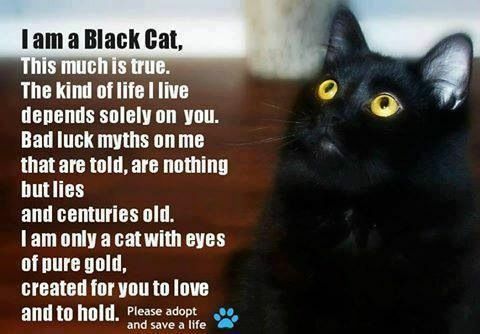 Black cats sadly are still struggling to get out from under the veil of superstition they’ve been under for many, many years. 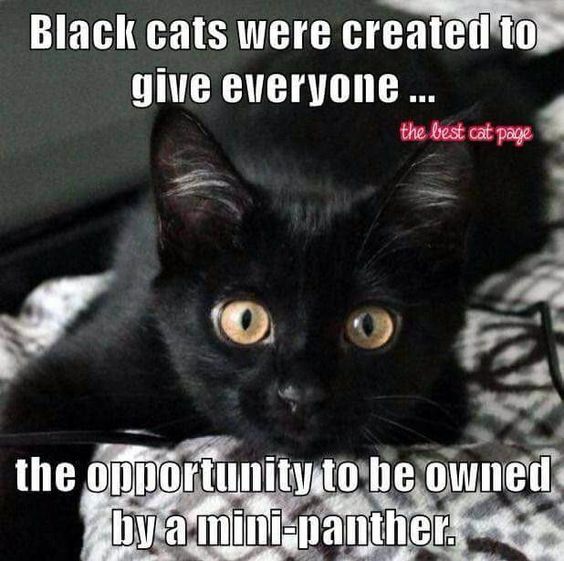 But those of us who have been lucky enough to have had black cats in our lives know how great and loving they really can be. 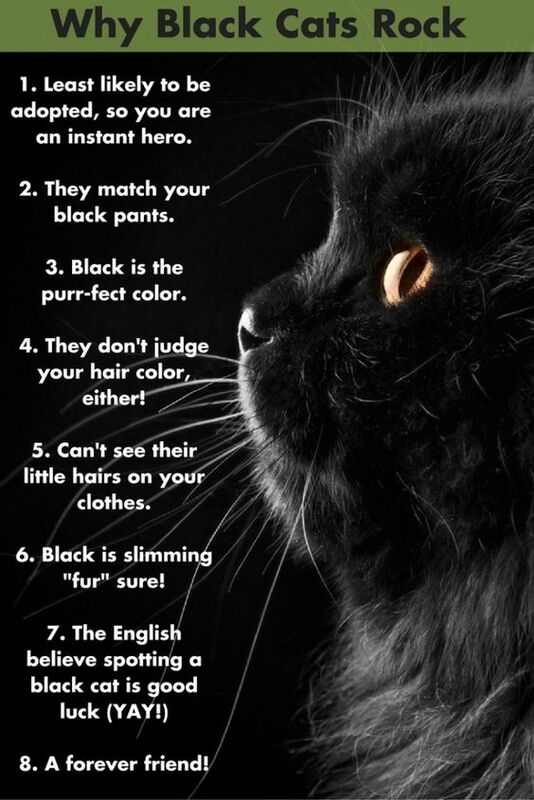 Categories: animals, general, Uncategorized | Tags: Black Cat Appreciation Day, Black cats, blog post, cats, pets | Permalink. Eager to present his present to her, he ran inside the house and into her room. He jumped up on the bed, but when she didn’t wake right away, he let out a small mew. When she still didn’t wake, he crept up and lightly tapped her cheek with his paw. Finally, she stirred, and he sat back and dropped his present on her chest. Her eyes snapped open and she beheld her black cat sitting proudly beside the dead mouse lying on her chest. 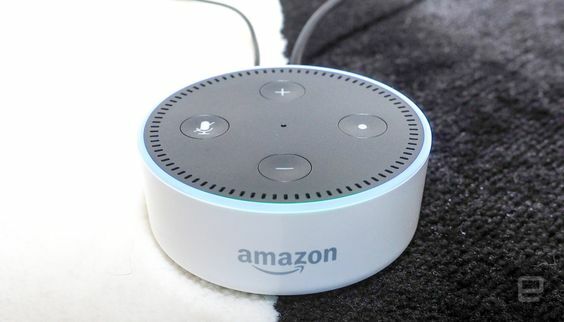 She shrieked and the cat watched, bewildered, as she swiped the mouse away. He jumped off the bed and ran from the room, wondering why she didn’t like his present. Categories: animals, general, Uncategorized, writing | Tags: #tuesdayuseitinasentence, blog post, cats, present, prompt, writing | Permalink.